Margaret Atwood. Strange Things. A Reader's Companion and Study Guide. "In Strange Things, Atwood turns to the literary imagination of her native land, as she explores the mystique of the Canadian North and its impact on the work of writers such as Robertson Davies, Alice Munro, and Michael Ondaatje. Here readers will delight in Atwood's stimulating discussion of stories and storytelling, myths and their recreations, fiction and fact, and the weirdness of nature. In particular, she looks at three legends of the Canadian North. She describes the mystery of the disastrous Franklin expedition in which 135 people disappeared into the uncharted North. She examines the "Grey Owl syndrome" of white writers who turn primitive. And she looks at the terrifying myth of the cannibalistic, ice-hearted Wendigo—the gruesome Canadian snow monster who can spot the ice in your own heart and turn you into a Wendigo. 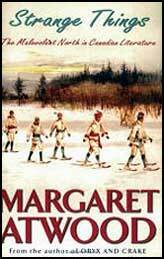 Atwood shows how these myths have fired the literary imagination of her native Canada and have deeply colored essential components of its literature. And in a moving, final chapter, she discusses how a new generation of Canadian women writers have adapted the imagery of the North to explore contemporary themes of gender, the family, and sexuality. " —The Publisher. short stories, poetry, non-fiction, children's books, etc.